A collection of memorable yarns about growing up in Florida, and nearly all of them are stunners. Writer and journalism professor William McKeen rounded up stories from well-known authors such as Michael Connelly, Carl Hiaasen and Tim Dorsey and journalists such as Anne Hull, Bill Maxwell and Jeff Klinkenberg (and me) and put them together with poetry and some fiction as a way to tell what it's like to be a kid with sand in your shoes. Some of the stories are short, some are long, but all are interesting. Readers from outside Florida may be surprised to learn that the Sunshine State has a dark side, as Connelly tells about witnessing a crime when he was a teenager, and Klinkenberg writes about a childhood adventure that went horribly awry, and Hull shows how the bright and shiny surfaces of this state hide some painful trade-offs. Highly recommended. This book was just OK. Maybe I am just disappointed because I had such high expectations and I was so not impressed. I started reading this book because it has a piece by Carl Hiaasen, one of my favorite writers. But the rest of the stories so far have been lovely, charming little portraits of the Florida that used to be, written by a wide variety of great authors who grew up in Florida before it was over-run by development. When I drove through the Cross Creek area of Northern Florida some years ago, I got a little glimpse of what that world must have been like and I would love to see more of the other pockets like that which I am sure must exist elsewhere in the state. This book provides a window into a world of unspoiled nature and the simple pleasures of childhood that once existed all over Florida. Highly recommended for everyone but especially for Floridians and for those who remember what it was like growing up in America forty or fifty years ago or more, whether in Florida or any other state. Really good collection of stories and essays from native and naturalized Floridians. Some are heartbreaking (Ken Block's story of his younger brother's fight with cancer, for example), others entertaining, but all are at least decent. It seems to focus heavily on the south Florida/Miami area--not sure if that was intentional or simply how it worked out with the submissions they received. 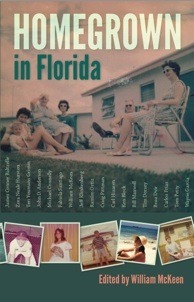 Definitely worth a look for anyone interested reading about life in the Sunshine State. Some great stories, always sincere if not always written well. Florida has been so decimated by developers that one can't help but be somewhat nostalgic about the past. Many of the stories focus on the glory of spending time fishing and spending time in a wild landscape.Appropriately, other anecdotes concern Florida's racism and environmental destruction. Good bits by Carl Hiaasen . I don't read a lot of non-fiction, but I couldn't resist reading about growing up in Florida through the years. This book brought back so many memories, good and bad, of being a kid here. Thank you to all the contributors. DNR - I had to put this on my "Do Not Read" list. It contains some of the authors that I like, however, it wasn't the type of book (fiction) that I enjoy. Sorry. I normally don't like short stories. This was great! William McKeen - Author of Mile Marker Zero, Outlaw Journalist, Highway 61, Rock and Roll is Here to Stay and several other books, William McKeen teaches at Boston University and chairs its department of journalism. He lives on the rocky coast of Cohasset, Massachusetts.